A woman being exposed to more pollutants than she’d like. With a homebuilt $300 pollution monitor strapped to his bicycle and seven years of Portland State University education in his brain, Alex Bigazzi has been leading a deep exploration into your lungs. Bigazzi’s findings might be an argument for electric bikes, which let people move quickly through an area without exerting themselves heavily. Since we wrote last year about the PSU Ph.D candidate’s research into the amount of pollution people ingest while biking, Bigazzi has been taking what the Portland Tribune called his “breakthrough findings” on a successful tour, authoring two upcoming journal articles on the subject and, last week, presenting them (slides, audio) at the city’s “Lunch and Learn” series about bike transportation issues. By designing his own low-cost equipment, gathering data from his own commute and others’ and thinking critically about previous research, Bigazzi has taken the science of pollution ingestion to what you might call an obsessively practical new level. Here’s some of what he’s found so far. 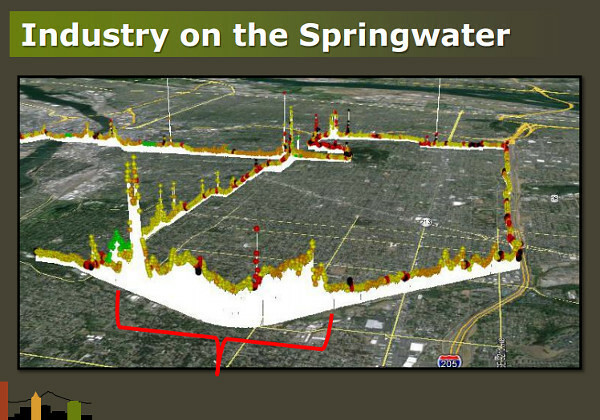 1) The Springwater Corridor is a surprisingly polluted route. Slides from Alex Bigazzi’s city presentation last week. Bigazzi discovered that the air along the city’s best off-street path is actually some of the dirtiest, at least where traffic-related gases and grime are concerned. “Even though we’re talking about traffic-related air pollutants, it’s not all coming from traffic,” Bigazzi explained last week. The many industrial developments near the Springwater (a former freight railroad), including Precision Castparts‘ three operation facilities for steel and titanium, send industrial solvents and other potentially harmful substances into the air. 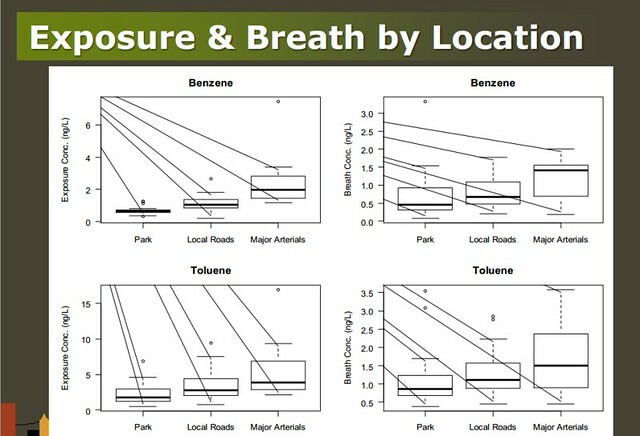 But here’s one of the big insights in Bigazzi’s work: when it comes to biking, exposure to pollutants isn’t everything. 2) Harder pedaling means more pollution per second — but fewer seconds of exposure. The biggest contributor to pollution intake, Bigazzi found, isn’t actually how dirty the air around you is. It’s how much of it you breathe. That creates an interesting mathematical puzzle: the harder your body works, the more pollution you breathe in. But the faster you move, the less time you’ll spend in the dirty air. So assuming you’re headed to a place where the air is cleaner than it is along a roadway (Precision Castparts commuters, take note), here’s a curve Bigazzi constructed that shows the optimum speed to ride for various bikeway slopes. It’s expressed in kilometers per hour; the 17.5 kph “minimum ventilation speed” for a flat 0 percent grade is 11 mph. 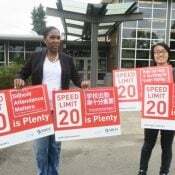 For a steep 10 percent grade, the optimal speed would be just 3 mph; for a 4.5 percent grade like the one on Southeast Belmont near 11th Avenue, the optimal would be about 6.2 mph. At Thursday’s presentation, one of the attendees made an interesting point: Bigazzi’s findings might be an argument for electric bikes, which let people move quickly through an area without exerting themselves heavily. 3) Biking on a big busy street is a lot dirtier than biking on a local street. 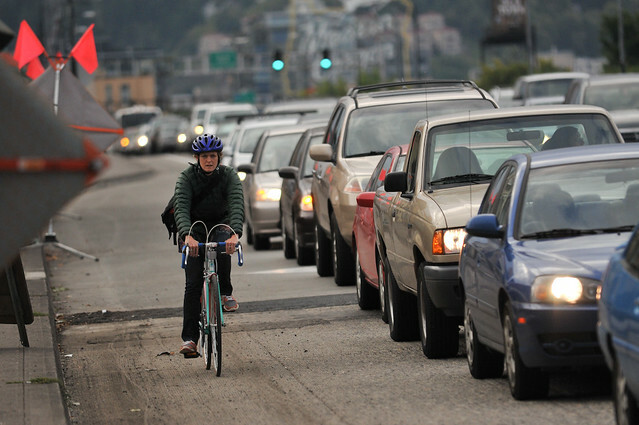 Based on these calculations and Bigazzi’s hard data, he found that biking along a major arterial like Powell Boulevard means ingesting three to five times more traffic-related pollutants than biking on a local street. 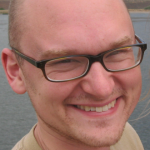 There’s been some study of pollution levels in protected bike lanes, Bigazzi said, and pollution exposure there seems to be “measurably lower than where a bike lane would be on the same facilities for traffic-related air pollution.” He said he didn’t have exact numbers on this phenomenon. 4) The good news: Pollution problems are outweighted by the huge health benefits of biking. Bigazzi, who obviously rides a bicycle himself, is sensitive to the charge that because he’s found that people on bikes (or foot) are exposed to more traffic-related pollution than people in cars, he’s implying that biking isn’t healthy. The opposite is true, Bigazzi said. The act that puts bikers and walkers in contact with pollution — exerting their lungs — is so inherently healthy that it more than offsets the pollutant’s damage, other scholars’ studies estimate. The same is true, he said, of whether people should avoid biking on major streets. Not if that’d mean taking a car, he said. Very cool research! Thanks for publishing this here. Um. I don’t know. The extraction, refining, processing and transport of the rare metals and fancy materials that go into the motor and batteries are precisely what causes the (various kinds of) pollution we’re all trying to escape. The ebike suggestion is not that different from cranking up the AC because it is getting hotter. thankfully most high capacity batteries use lithium – a very abundant metal that is straightforward to recycle. I believe this is also why Tesla was so willing to expose and share their patents. There have been several more lithium stores found in the US recently, and the principles at Tesla are involved in those operations. Some of those guys see more to the big picture than just electric cars… they’ll own the supply chain. 9watts, given that the article specifically mentions fabrication of steel and titanium parts, couldn’t this argument also be made? If having a pair of e-bikes takes a couple from two cars to one, even aside from the change in the number of trips they make on bikes, that probably more than makes up for the pollution caused by the relatively small battery and motor. Perhaps. But mostly we’ve made no progress whatsoever by following the eliminate-one-car-for-two-e-bikes logic as it has been applied to most of the product categories I can think of. It sounds nice and even plausible, but in practice our consumption patterns always outstrip whatever net reductions we were ostensibly going to experience as a consequence of those efficiency improvements. The thing we need to be doing is eliminating the need for whatever Precision Castparts (and all the other companies that foul our air) make. My assumption is that if we go for the e-bike/-car/-house thing, companies like Precision Castparts will expand their operations and pollution (of all sorts) will go up. 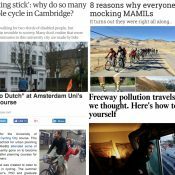 My takeaway is that, since the exercise health benefits of cycling greatly outweigh the pollutant health harm of cycling, then e-bikes are far less beneficial to health than conventional bikes. That’s my guess too, but Bigazzi said he wasn’t sure how that math would work out. It is an interesting question. I think you’d have to consider the incidence of lung disease versus the incidence of cardiovascular disease and obesity. My impression, but hardly verified, is that among non-smokers, the former is much lower than the latter, which if true would suggest that trading off increased exposure to air pollutants for increased cardiovascular exercise and weight control would be a good deal. I think it might also depend on the base fitness level of the study participant. Take someone who bikes daily, strenuously, versus someone who rarely or doesn’t exercise and put them on the e-bike. The people who don’t exercise would be breathing much heavier versus some who would still have low heart rates and barely be warming up. 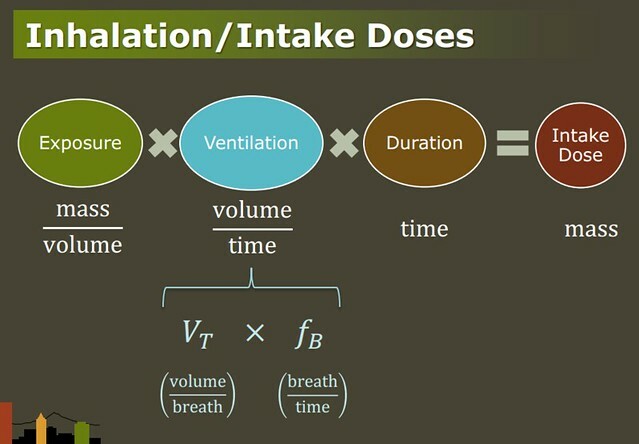 The Lactate Threshold between the two would be radically different. That’s a factor that I don’t see in the original study either, but would definitely skew the math. My personal experience has been that there’s no comparison between being on a MUP vs in a bike lane. I can smell the exhaust and feel the heat in the bike lane. Do any bicyclists intentionally stop next to a diesel pickup at a stoplight? If Precision Castparts is that big a polluter, maybe DEQ needs to address the issue. So people aren’t going to be taking polluted air into their system as long as they don’t breathe it. Not very reassuring. Hey kids! 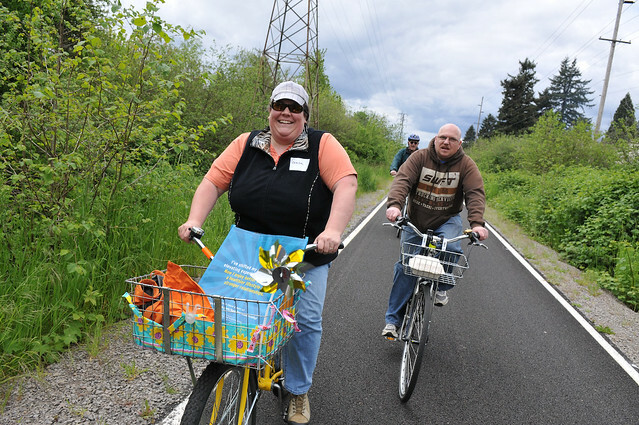 Here’s a game we can play as we ride the wonderful Springwater corridor trail: ‘ Through how much of the Precision Castparts and other industrial zone polluted section of the trail, can you keep from breathing in the polluted air? ‘. Signs along the trail, informing those riding it of at what point they’re about to enter and leave the high concentration zone, could be something to consider. Precision Castparts could use the PR exposure. I ride SpringWater MUP from se136th to Sellwood 2x a week. Sure there are industrial locations that you pass where the chemicals can be smelled/noticed , tho haven’t detected them near PreCast. Industrial and tail pipe pollution is a contributor to lung and cardio-vascaular disease. A major contributor to PREMATURE DEATH. It’s absurd that we freak out about low-grade toxins in our food but tolerate far more dangerous toxins in our air. Instead of shrugging our shoulders at this preventable socioapthy (because exercise reduces risk – feh) we should be angry, very angry. But … but … Jobs, economy, freedom, apple pie! And how about plain old stink. The brew pubs, coffee roasters and many restaurants. smell you from blocks away. I don’t think you are going to find many sympathetic ears to “smell” pollution in an article that discusses pollution with serious health effects. Diesel exhaust doesn’t just smell bad, it shortens your life. On a side note, personally, I think that the brewery smells are great, but I’m a home brewer. I love riding by Bridgeport or Laurelwood. Oh don’t get me wrong, I brew too. Sometimes my wife is none too happy with the smell. I would love to smoke the old pipe once in a while but she drew the line. Environmental impact isn’t always measured by gauges. Ticonderoga, NY was the worst I’ve ever smelled. This research supports the obvious – to minimize exposure to pollution while traveling via human power, move at the most efficient speed (from the standpoint of energy consumption), which will also be the speed at which one consumes the least amount of oxygen (or air, more broadly) during the course of the trip. Less exposure to air overall, less exposure to pollution. 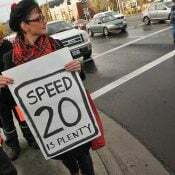 And it should be pointed out 11mph is only for the test subjects. 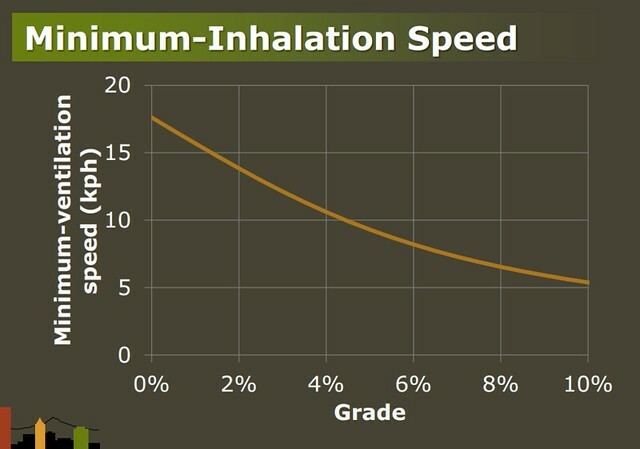 If one struggles to average 11mph, obviously your pollution exposure would decrease at a more relaxed slower speed. And fit people can probably average much faster and minimize exposure. if you’re not breathing heavily, you’re not getting very much health benefit though (certainly no aerobic workout). Sounds like fixies are the way to go. I generally do slow down to 3 mph on a 10 percent grade riding one of those. It was a very interesting presentation…this is good coverage. This Urban pollution is why when commuting I generally stick to the greenways unless I am in a Hurry. The Springwater spike information is very useful, especially since it was compared to the I 205 MUP which had significantly lower emissions. This also shows just how bad motor vehicle traffic is for your city’s collective health. This problem affects everyone in the city, including those that walk, play, and even drive (drivers breath much of the same pollution while driving). It’s also important to note that a free-flowing road at capacity and a congested, slow street pollute the same amount per mile. Anyone claiming that expansion of roadways will reduce pollution is full of it. It will just bring more cars and more pollution. The best thing we can do for the health of our citizens is to give priority space on roadways to bikes and public transit. Since no one’s mentioned it yet: This and other quotes imply that we’re moving through a pretty uniform level of pollutants in our metro biosphere. So when people cop to lane splitting, sign/light running, bizarre positioning and other hijinks because they “don’t want to breathe fumes,” that would seem to be bogus. The risk isn’t that localized — and we *are* breathing them in some form, regardless. However, the risk *of collision* can be highly localized, moment to moment. I’m going to have to slow down climbing grades. Interesting. No mention of prevention, i.e., wearing masks or the 205 Bike Smog trail? Yeah I was just wondering when people are gunna start suggesting P1000 particle masks along with the reflective vests and helmets for riding a bike. Pretty soon were all going to end up looking like the hero of some Sci-movie or video game. I suffer from what I believe to be automobile exhaust-induced asthma. So I plan my commute and rec. rides according to wind conditions – this way I will maximize my upwind-of-motorists portion of the trip. Also, if streets and roads have paved shoulders, I ride on the left if it is significantly upwind of the tailpipes; I look forward to a time in my community when an increased presence of other bicyclists makes this unfeasible for reasons of safety and courtesy. Hey, do you ever hold your breath when riding through what you may not see but know to be plumes of highly concentrated automobile exhaust, areas such as where motorists initially gas it from a stop? It becomes a feeling that I so-wish they could experience! Purposeful salmoning based on wind conditions? Hoo boy, that’s just begging for Bike Snob’s attention. Not to make light of your breathing challenges; here’s wishing you a lasting reprieve. 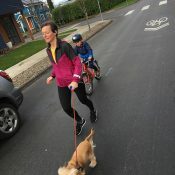 Gradually move polluting companies out of densely populated areas through higher (pollution) taxes, gradually lower the taxes of “office building” type of companies in densely populated areas (and out of Hillsboro), gradually raise the price of gas with taxes and use to create more bike lanes. I’ve wondered whether the wall between the MUP and the freeway along 26 helps or hurts in this regard. – Are heavier pollutants prevented from getting over the wall? – Do eddies/turbulence in the airflow over the wall actually cause a higher concentration of pollutants immediately behind the wall? Heh. Figured it would depend on the weather. It’s been long proven in the UK that there is more pollution in a car than on the street because the car holds a pocket of dirty air. I didn’t see his in car pollution for the same trip at the same time in this article so not sure how driving a car to reduce pollution exposure claim can be made in this context. We have ebikes and no car so that’s a no brainer for reduced emissions even taking into account production you can’t compare a car to a ebike and a few batteries over the same lifetime, I think it’s one car to 20 bikes resources wise to build. Doesn’t include fuel transportation and the fact only 1% of the petrol is used to move you forward. I think 9watts needs to get to grips with war in the Middle East for gas compared to buying lithium from Chile… Doh! I prefer to do without either, thank you. 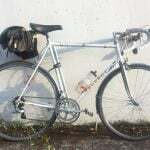 Years ago while working in Hillsboro in GM’s dealer support call center a visiting design manager came into the bathroom while I was changing into shorts and tank top for my ride home on the Sunset Highway “bike lane” to Beaverton. Conversation was started by him; “You ride a bike and they let you work here?”. I asked him if any thought had ever been given to changing the design of exhaust systems especially those on trucks that direct the pollutants to the right side directly at pedetrians and bicylists. His answer; yes it has come up, but the cost analysis and potential ROI where prohibitive. He said it would cost over $1 bil. to retool all right-side-directional exhausts. As for manufacturing pollutants here in Or versus Wa…. I used to work for a fiberglass yacht builder near Columbia Blvd/40th and no styrene filtration was required by the state. Directly across the Columbia River, however a similar facility was required to have all air inside pass through a water barrier syatem that would capture the gases and then subsequently be concentrated and disposed of as hazardoua waste. It added approx 5% to their production overhead costs. My bike commute is a battle, I carry a knife and mase and I can access both very quickly while riding. I prepare to defend myself from coal-rollers, transients, stray dogs, and inattentive drivers. Commerce is happening, the economy is living and breathing(pun), things need to get made, industry is a fact of life. You cant make it go away, no matter how many people ride Chinese electric bikes. (when your battery dies, get out of my way). I live in a somewhat dirty city, and I accept that. However, we have it pretty damn good compared to some other cities I have been to, Mexico City, the 909….the ‘Couv (ha ha ha). Just ride your bike and enjoy yourself. Congrats on the good work, Alex! It should not be bicyclists responsibility to minimize pollution exposure, it should be the polluters responsibility. I appreciate the “what can I do today” tips, but don’t lose sight of the fact that we can and must clean up our air for the health of everybody.